There are so many reasons to love hand embroidery. First of all you can take it anywhere. Second, it’s an easy way to add cool handcrafted details to any project. And third, it’s really fun. Even if you are not as passionate as I am about handstitching, you can’t deny the simple elegance of running stitch. There is no end to the cool details you can create just by adding running stitches to your next sewing or refashioning project. Here’s a fun example on a simple A-line wool skirt. 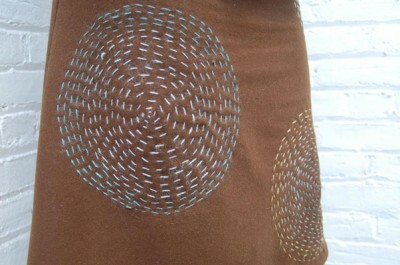 I used crewel thread in related colors to create big circles of running stitch randomly placed on the skirt. It turned a basic skirt into something fun! Want to experiment? Try any of these running stitch ideas to quickly update a plain garment or sweater from the store or your closet. Tell us how you get creative with running stitch in your projects! I’ve just used some the running stitch on a blouse that I sewed for myself. It’s a plain white cotton/linen blend short sleeved blouse with the running stitch in Christmas red around the neckline, sleeve hem and hemline and vents. Embroidery just makes the whole blouse pop and it’s unique. Love the handwork in garment sewing. I’ve had a very brief introduction to embroidery, traditional European, and Sashiko, which is a type of Japanese embroidery that is essentially a running stitch formed with a very long needle and thick thread. For now, I’m limiting myself to the pickstitch on places like collars, cuffs, and zippers. I find the large running stitches you’ve illustrated too “crafty,” too Alabama Stitch Workshop, or whatever it’s called. Yes, I know some people like this look. I also understand that you’re showing something that’s simple and accessible to all readers, some of whom have limited equipment, but I would not use this particular embellishment on adult clothes. I will try using crewel thread some time, however. Thanks. Thanks for the inspiration! I have a shirt I’m working on that I’ve stalled on…don’t really like it, but don’t know how to fix it. Now i’ve got a new direction to think in! Thank you so much for this little reminder that sometimes the simplest techniques achieve the most wonderful results! I will be working some running stitch onto the next dress I make myself for a refreshing change to regular embellishment.